hello, im hoping I can get some advice and suggestions on blazer boats. the closest dealer to me is 3 hours away and im really interested in buying one here in the next few months or so. I know I want to go with the blazer ss and I want to do either the 1756 or the 1856 paired with the 60hp mercury. what kind of speed can I expect out of that? or if anyone has any other suggestions I will gladly hear your opinions. Thanks! I'd order it with the all aluminum transom instead of the wood filled transom. Saves some weight but cost around $100 but no chance of the transom rotting. I'd guess low to mid 30's depending on how you set it up. Here is my 1852 blazer ss with 60/40 Mercury 4 stroke jet. Mine is a .80 gauge, I think in a 56 boat you can get .80 or .100 I personally like .80, it's lighter which means get on plane quicker and faster. If you hit stuff you will get dents in both. Just had some impeller work done to mine and gps the other day with full tank of gas, 9 gallons, myself, trolling motor, battery, and cooler, downstream constant 32-33 and hit 34 couple times. Will hit 31 with entire family, 2 kids wife and a bunch of stuff. Love my blazer ss. You can request it in .080. Fred at Current River Marine ordered my new boat with the thinner specs per my request. Thanks for info. Wanting a wider boat maybe next year and like .80. Wanting to get an 18/56 18/60. Wonder if they would make me a 19 footer? Things will have to go right but wanting bigger boat and motor. Will check into it more through blazer. Thanks again. I've got a blazer 1860 with 115/80 yamaha 2 stroke. 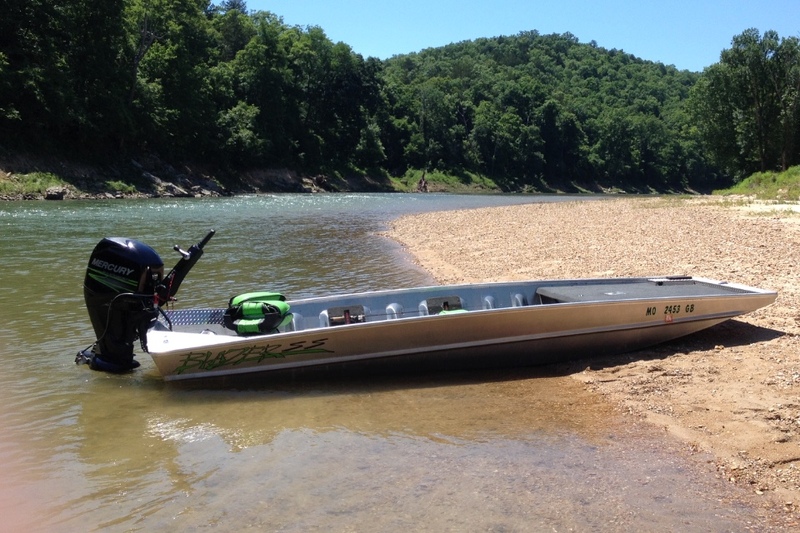 i get about 31-32 mph out of it with 30 gallon bait tank and 18 gallon gas tank. i have an 01 model but they dont make them like this one anymore. they putting the seat and consoles with foam in them. ive got a complete open boat except for front deck. i did a modification to my and move gas tank front back of boat to under front deck. wish they would still sell them like mine because people like the setup but i guess they require more flotation in boats now. Mine will do 27-29 up stream and 28-31 down stream. On a smooth lake 29 mph. 3 hours away, you're lucky. I bought mine almost 700 miles from my home.